How would a dolphin and a human swimmer compare in a race? Obviously dolphins are far better swimmers than humans. They would totally hand us our asses in a race. But just how lopsided would the contest be? A recent experiment shows it's not even close — and dolphins are even stronger in the water than we thought. The reason for the experiment dates back to 1930. While cruising on a ship in the Indian Ocean, E. F. Thompson observed a dolphin dart past the vessel in seven seconds. This observation led James Gray to devise a paradox that now bears his name, Gray's paradox. He estimated that the power required to propel dolphins through the water would have to be 20 knots (10.3 m s-1, or 23 mph, or 37 km/hr). Which is all sorts of extreme because Gray thought that dolphins did not have enough muscle to pull off the feat. Instead, he figured that the marine animals must use a trick of hydrodynamics to sustain such speeds. Indeed, dolphins are remarkably well-adapted to the water. Their shape is almost an archetypal form, one also utilized by the now-extinct Ichthyosaur (an excellent example of convergent evolution). And the special contour of their skin makes them incredibly smooth in the water. Some 60 years later, Frank Fish (yes, really) decided to put Gray's assumption to the test. But measuring the power of dolphins as they swim is easier said than done. To properly measure the force exerted by dolphins on the water, Fish resorted to a method that's used to measure the strength exerted by Olympic swimmers. 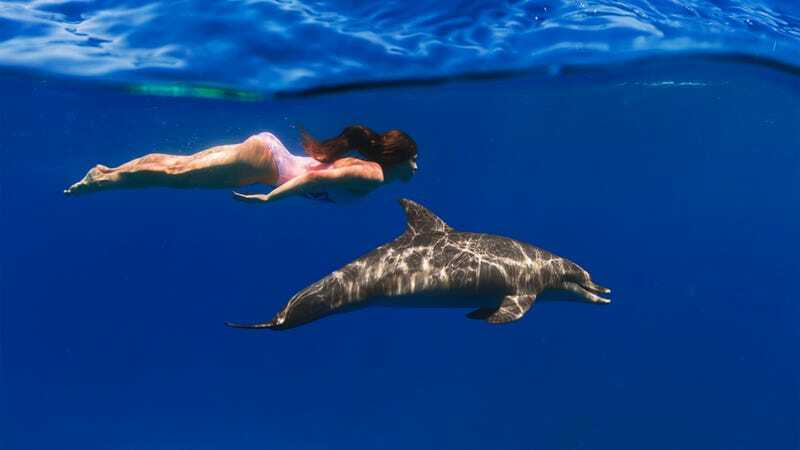 Called digital particle image velocimetry (DPIV), it's used to visualise eddies in the water in order to measure the forces exerted by fish, swimmers, and now, dolphins. Essentially, they get something to swim through a curtain of microscopic bubbles, and then they measure the movement of these bubbles to get a sense of force and motion. Working at the University of California at Santa Cruz, Fish, along with colleague Timothy Wei from the University of Nebraska, put the dolphins through their paces. They used a tank of compressed air and a garden soaker hose to produce the wall of bubbles. They filmed the dolphins swimming along the length of the bubble curtain along with the vortices set spinning by the dolphins' flukes. They could literally see — and measure — the water as it was being pushed backwards (the microbubble displacement rate) by the surging dolphins. Looking at the data, the researchers were finally able to calculate the power produced by the animals as they cruised at a leisurely 3.4 m s-1 (7.6 mph or 12 km/hr). Calculations revealed that dolphins are incredibly strong — on the order of 10 times stronger than human swimmers. That's an impressive 549 Watts, or about 1.4 times the power that a fit cyclist can sustain flat out for an hour. And during rapid accelerating, this jumps to 5,400 W.
The dolphin's fast cruising speed (a travelling speed they can maintain for quite a while) is about 3-3.5 m/s (6-7 knots, 11-12.5 km/hr). They can reach speeds of up to 4.6 m/s (9.3 knots, 16.5 km/hr) while travelling in this fashion. When they move faster, they will start jumping clear of the water (porpoising). They are actually saving energy by jumping. When chased by a speedboat, dolphins have been clocked at speeds of 7.3 m/s (14.6 knots, 26.3 km/hr), which they maintained for about 1500 meters, leaping constantly. If we limit the dolphins to the non-leaping technique (a speed of 4.6 m/s), they could finish a 100 meter swim in 21.7 seconds. By contrast the world record for a human, set by César Cielo in 2009, is 46.91 (an approximate speed of 2.1 m/s). If we allow the 7.3 m/s leaping speed, dolphins could finish a 100 m swim in a mere 13.7 seconds. Read the entire study at Experimental Biology: "Measurement of hydrodynamic force generation by swimming dolphins using bubble DPIV."